In these lean and mean times it is no surprise that here at MTI we are constantly informing the consumer to be aware of the so called “dodgy dealings” that exist in some parts of the trade. The more unscrupulous dealer will try and make an unhealthy profit by taking advantage of the consumers lack of knowledge, something at MTI we continually try to address. However, there has recently been evidence to show the consumer is being overcharged (some may say ripped off!) and ill informed by an unavoidable institution that is at the very heart of motoring and car purchasing in the country today. The Government run D.V.L.A. It was only after this completely unacceptable and costly error affected me directly that I stumbled upon the problem and subsequently started to dig a bit deeper. Oh for sure, I knew the D.V.L.A was not without its problems, show me any organisation as large and complex as they are, that’s dealing with literally tens of thousands of correspondence a day that doesn’t make the odd mistake. More often than not it consisted of the wrong colour on the V5, incorrect engine c.c. model variation not quite right, our name spelt incorrectly etc. All very annoying and time consuming to correct but this latest error was something far worse, in fact nothing short of scandalous! Rumours within the industry that all was not right at D.V.L.A. led to a major motoring publication doing its own undercover survey to highlight the problem, and it is only now we can all see the results for ourselves online at “PARKERS DVLA EXPOSED” where an incredible 76 out of a 100 undercover enquires regarding Car Tax Banding / CO2 emissions were completely wrong, not only that, vehicle V5s were actually being sent out with the wrong C02/G/Km bar coding resulting in some motorists paying a higher road tax than they should. This was very much the case with my own DVLA experience just this month. I had purchased a barely four year old Mercedes Benz CLK “Avant Garde” 270 CDi Automatic. Having looked up the CO2 rating at “Mercedes Benz UK” and in the industry’s “Glasse’s Guide” before purchase, I was pleasantly reassured to find as a “Diesel variant” it fell into the lower group I for this size of car. With a G/Km of 183 giving it meant an annual road tax cost of £175.00, saving almost £50 per annum compared to my last car and bearing in mind the new rate changes since 1st May 2009. Imagine my surprise then when I looked at the V5 document and saw the figure of 188 G/km clearly printed and bar-coded. if this was correct (which I was sure it wasn’t) it would take the emissions over the cut off banding of 185 G/km and push the vehicle into tax band J meaning a hefty £225 per annum fee, then rising yet again to a hefty £300 in 2010. I was having none of it, as far as I was concerned the government had had enough of my “hard earned” (along with just about everyone else’s) and I wasn’t about to give them any more for free. I checked and double checked, with a very helpful chap at Mercedes Benz UK who pointed out that “as far as he was aware, Mercedes didn’t make a model with a 188G/km” emission. Just to be sure I telephoned an Independent Mercedes Benz specialist in the north who happened to have on the internet the exact same model and year as mine (almost to the month!) sure enough, his V5 clearly stated the CO2 as 183 G/km. Armed with this information I telephoned the D.V.L.A. Hotline and after the usual five minute menu scroll I was put on hold for a further ten minutes as they were “experiencing a high volume of calls” no change there then. When I finally got through to the person at the other end of the line they were unable to tell me the correct C02 for my particular vehicle “as the information is not available to me”. Let’s just look at that for a minute, you are in the “Road Fund License” customer enquiry office at the Head Office of the largest D.V.L.A. in the country and yet you have no information as to the correct banding of my particular vehicle? I beg the question, WHY NOT! Rightly sensing I was getting nowhere fast I asked to speak to the supervisor on her section, (they always have a supervisor for when people like me ask questions that are not on the script sheet!) and very helpful she was too, informing me I could write in enclosing all of my documentation and a covering letter and they would look at it on an individual basis. So I did, and now I await their decision. As far as I am concerned there can only be one outcome, and that is the legally correct one. But that’s not really the end of the issue, for me it may be, but what about the previous owner who taxed the said vehicle for almost four years before I acquired it and paid quite obliviously the WRONG amount? But perhaps more worryingly still, how many other incorrect V5/2s are out there? 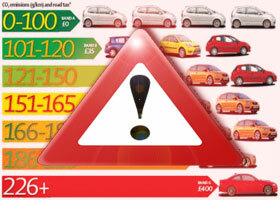 After all, when did you last check that the road tax you are paying for your vehicle was the correct one? Maybe now’s a good time. When I do eventually get this sorted out, do I contact the previous owner and present the facts as they may be? And even if I did, is there a system in place to reclaim the overpaid tax? Or is it best to simply “let sleeping dogs lie” so to speak, whatever the outcome, I sincerely hope the D.V.L.A. much like our current Government, puts its house in order, and fast! DVLA 5 days grace on tax disc – who wants to put it to the test?